Comets are often described as a giant "dirty snowballs" because they are mostly made up of ice. Comets have two "tails", one made up mostly of rocks and dust, the other mostly made of gas. Comet tails always point away from the Sun. Think of a comet as a big, dirty, gassy snowball. Comets are formed in the ring of rocks, dust and ice that orbits the Sun beyond Pluto called the Kuiper Belt. Comets form when rocks, dust and ice condense â€“ that is, join together. As a comet gets bigger and bigger, it starts to be pulled towards and around the Sun. Comets in our Solar System usually take many years to go around the Sun â€“ from a few dozen years to many thousands of years. This is because they orbit the sun from so far away. They make long, egg-shaped orbits around the Sun instead of almost circular ones like the planets. What does a comet look like? 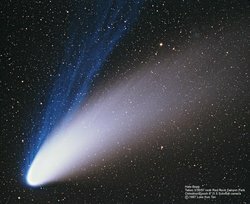 The comets that can been seen in the sky without telescopes are unusual because they are the biggest and brightest comets of all. Most can only been seen with a telescope. When comets are very far away from the Sun they are covered in a coating of icy, black rocks and dust, but as a comet approaches the Sun the ice starts to melt. This creates large amounts of water and gas that break through the coating, freeing some of the dust and rocks. Sometimes this water, gas, rocks and dust can been seen from the Earth as one or two tails streaming away from the comet. Even when only one tail can be seen, there are two, one made from the lighter gas and water, and the other from the rocks, dust and chunks of ice. The "great comets" that produce particularly spectacular tails are some of the rarest objects in our solar system. Usually they can only be seen about once every hundred years, so it is very rare to see one of these comets. The last Great Comet appeared in 1910, but it may still be another hundred years before another one comes near the Earth. Astronomers can't predict when they will appear as there are still things about our Solar System that they don't understand. If you hear about a comet coming into the sky soon then just follow the instructions below to go see it! Find out if the comet is going to be in your area of the sky. Tell your parents about the comet's arrival. Get a telescope or binoculars and some chairs to see it. Many of the largest comets have never even needed a telescope to see them. Ask your parents to take you to a park, the woods, or another dark place away from city lights. Look up into the sky and enjoy this amazing sight. There are likely to be thousands of comets that orbit the sun. Most of these are very far away and can't even be seen with a telescope. Some spaceships, like the SOHO telescope, have seen over a thousand different comets. Most of these comets either crash into the Sun or leave the Solar System entirely because they came too close to one of the planets like Jupiter or the Earth. There are only 160 comets which orbit the Sun and can be seen by telescopes. The rest are so far away that they can't be seen. How is a comet named? A comet is usually named after the astronomer who first discovered it. When several people are involved in its discovery, sometimes you will see multiple names on a comet, like Comet Hale-Bopp, or Comet Shoemaker-Levy. It is generally considered to be a great honor to have a comet named after you. 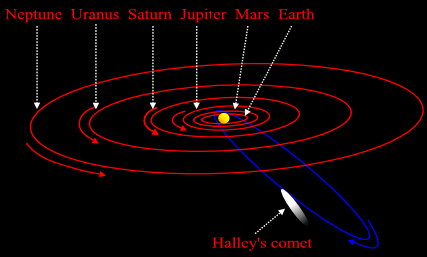 This diagram shows the orbit of Halley's comet around the Sun. There are a few things to note about this orbit. *It is much more elongated than a planet's orbit. *It is not in the same plane as the planets. *It goes round its orbit in the opposite direction. This is called retrograde motion. *The tail points directly away from the Sun. Halley's Comet - Perhaps the most famous of all comets, and this was the first comet to be identified as a recurring comet. Comet Encke - The second comet to be identified as a recurring comet. Comet Shoemaker-Levy - This was the first comet to have been observed hitting another body in the Solar System. In this case, it smashed into the planet Jupiter in what was possibly the most studied astronomical event in history. Do comets bring bad luck? In ancient times people didn't have a very good understanding of what Comets really were or where they came from. They were seen as very unusual objects in the sky, and very temporary in nature as well. In some societies it was often a sign of bad events in the future when a comet arrived, associated with the death of a king or a significant military defeat. In other countries Comets were considered to bring good luck, with increased fertility and more food. The ancient Chinese astronomers seem to have done the best job of actually recording when comets appeared in the sky, and left detailed descriptions of what they looked like and approximately where in the sky that each comet was seen. Even as recently as the 1910 appearance of Halley's Comet there was widespread panic when it was discovered that the Earth might pass through the tail of that comet. The panic was over having the gases from the comet flood the atmosphere of the Earth with poison. The reality was that there is so little gas in a comet tail that there is no measurable effect in the content of the Earth's atmosphere when an event like this occurs.